The most noticeable change is that the dashboard looks a little different. Nothing drastic, just a little facelift intended to make managing your content easier. Moving the left menu up means more room if you tend to keep a couple of sections open at the same time. Fiddling with the font sizes in the header also created more vertical space, so you can make your writing window/post box bigger on the editing screens (you can drag the lower right corner if you use the Visual editor, and/or change the default height of the writing window in Settings → Writing). We’ve also replaced the icons in the Visual Editor toolbar with new ones designed by Ben Dunkle, the same person who designed the navigation icons for the dashboard, that we think are less distracting and fit better. You’ll also be saying goodbye to the “New Post” button that used to live in the header. We’ve added an “Add New” menu to the admin bar instead, for faster, easier content creation. Oh, I almost forgot — we’ve made a number of performance improvements to make everything in the Dashboard run just a little bit faster. Yay! This is a small improvement, but it feels huge. If you’re like me, sometimes you might not want to approve a comment unless you have written a reply. It used to be that if you clicked to reply to a pending comment in your Dashboard, your reply would be published but not the original comment. I know, I know, it’s not like it is difficult to click on Approve. But! We’ve made it better anyway. 🙂 Now when you reply to a pending comment, the submit button will say “Approve and Reply,” and will perform both actions at the same time. After using this for less than a minute I was completely hooked. 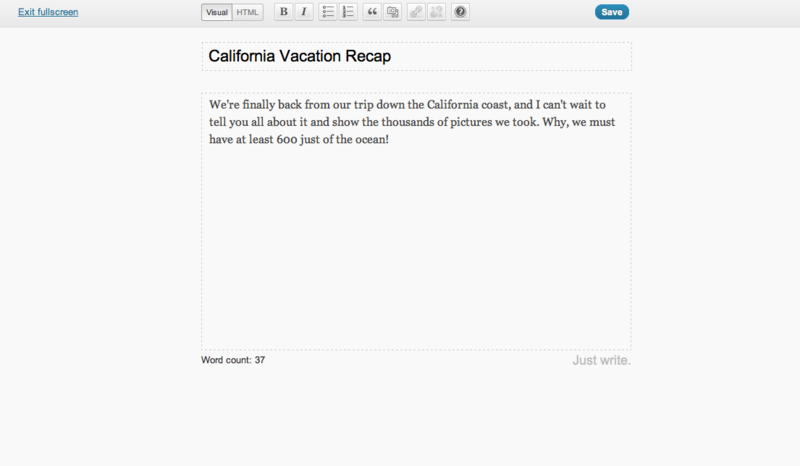 The other big change — one that we love — is a major upgrade to the full-screen writing experience. The normal posting screen is great: you can set it up the way you want it, and you can add and edit every piece of metadata related to your post in addition to writing it. Sometimes you just want to focus on writing, though, without all the extras, right? If that’s how you feel, you may have used the full-screen writing mode in the Visual Editor before, accessible by clicking a blue screen-shaped icon in the top row of the toolbar. That full-screen mode took up the full browser screen, which was cool, but then your lines of text went all the way across, making it harder to read and edit your creations. The Visual Editor toolbar stayed up top, which was handy if you wanted to add a picture or a link, but was a little bit distracting because of the colors. And if you zoomed or resized your browser, that was not good. It’s available for all users, whether you use the Visual Editor or HTML. Visual Editor users will notice a more laid-back icon to enter distraction-free mode, and HTML users will see a new [fullscreen] button. Click one and you’re on your way. Distraction-free writing mode still takes over the browser window, but the writing area is optimized for a comfortable line length and easy reading and editing. 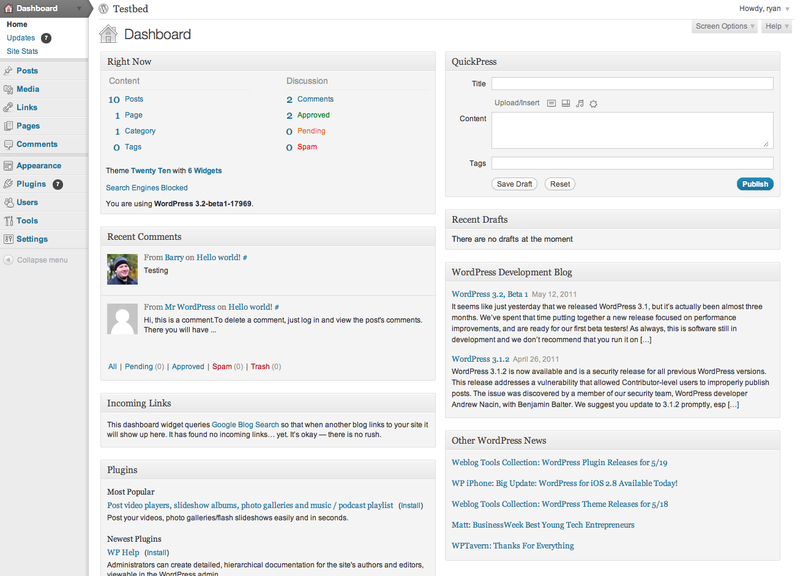 Editor styles set by themes are also supported. Tip: make your browser go full screen if you really want to be distraction-free. Press F11 on Windows, or Command+Shift+F on a Mac. To disable full screen, use the same keyboard shortcut, or move your mouse to the top of the screen to reveal the menu. If you encounter a bug, something looks weird/broken, or you need help with the new distraction-free writing feature, please let us know in the special distraction-free writing support forum instead of leaving a comment about the problem on this post. Note that we’ll be continuing to touch things up as needed based on your feedback for the next couple of weeks. To comment on the new distraction-free writing feature, go try it first! Write a post and see how it feels. Give it a “just write” tag. Then come back and tell us what you thought about the experience and give us your feedback in a comment on this post. Include a link to the first post you wrote in dfw mode so we can check you out. I will personally read every first “just write”-tagged post that is linked in the comments within 48 hours. I will (completely subjectively) choose my five favorites posts and feature them on Freshly Pressed, and will also send the authors a WordPress swag pack (buttons, stickers, maybe a surprise or two) as a prize. Note: I am easily swayed by correct spelling and grammar, so be sure to make use of the built-in spelling and grammar checker! Running Barefoot — Alaska to Vermont: Eloping with Edge! Just kidding, I know you meant that you’re going to post a *picture* of a ballerina to your blog. Don’t forget to use the “just write” tag to enter the contest! Faster dashboard and full-screen writing experience. Great. I love these upgrades. Thank you, WP team. LOL … you guys are making it way too easy and taking away all my excuses! I want to say thanks and kudos … but then again I don’t!! =] I heart WordPress. So far, I have used google docs to write my blogs, then copy and paste them in. I really do like the google interface for writing. However, I will give the new distraction free writing feature a try. Thanks for the update to the dashboard. 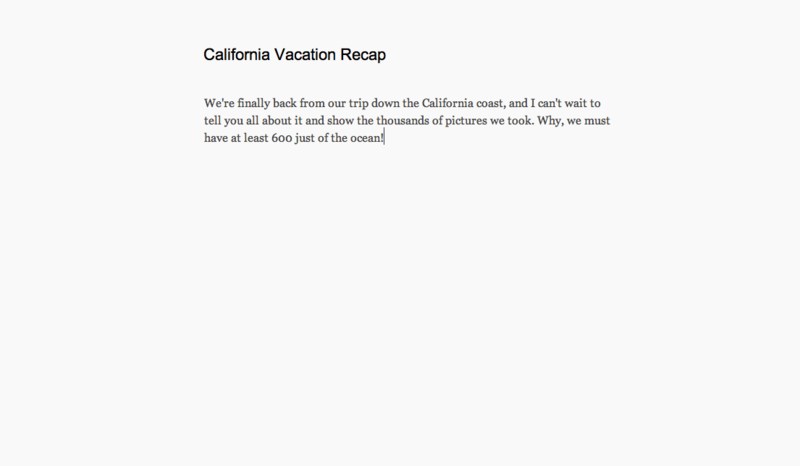 Did you see the Google Docs feature we launched recently? In the end, whatever works best for you: that’s what we want you to use. It’s your blog, after all, we’re just the middle man! An awesome, helpful, creative middle man (on our good days, anyway), but what’s most important to us is that you feel at home here and have the tools you need. WordPress.org users can help with beta testing 3.2, with an expected release date at the end of June. Just noticed the updated dashboard a few minutes ago and immediately checked for 3.2 features. 🙂 I’m a total full screen and distraction free environment fan. When will this rollout to the self hosted wordpress.org version? WordPress core is in beta testing right now, with an expected release date at the end of June. Love the distraction free writing. It makes it loads easier to write. Awesome! Don’t forget to link to the first post you write with it to enter the contest! If there’s one website I’ll visit every single day and still want to do it more with every passing day… it’s WordPress! You guys come up with something so often it’s surprises me how other blog platforms out there still exist! WP is like the Google of blogging, ha ha. Noticed the new sidebar a few seconds ago. Everything looks so much nicer now! Thanks again, WordPress! How can I change it back to the old look? Is that an option? I don’t like it at all. Sorry, that’s not an option. Give it a few days, I bet it will grow on you! I have to tell you that I am constantly impressed by the level of dedication of the WP team to providing new innovations for the community. I don’t use all of them and there have been some that I have not liked all that much; but most are terrific and, what is more important, it is clear that the WP team takes its job seriously and cares about its bloggers. 1) I’m seeing the dashboard in IE6 and it looks exactly like the “modern browser” pic (except I’ve got it set to blue instead of gray). 2) For much of the day, I’m away from a computer where I have control over the browser, or any other aspect of what’s installed on the computer. During this significant portion of the day, I’m forced to use IE6 not by choice but by corporate inertia. During such a day I may have breaks or other opportunities for a little free time, and at such moments I like to have the opportunity to interact with my blog readers or write up a post… Might I suggest that the majority of your users who are using “outdated” browsers are not doing so by choice? Right now, everything to do with my subscriptions is defaulting to the Freshly Pressed page. Most stats are unavailable, and I don’t really see anything new that would make the glitches worth putting up with. That does not sound like it is related to the feature update. Can you contact support so they can help? That’s the most current version, yes. I’d expect us to drop support for IE7 soonish, too. Maybe within a year? That’s all very nice to know and thank you for it. Seeing as I’m new here and been having a few hiccups. What happens if Firefox 4 is your browser? Nothing! 4 is the most recent version of Firefox, so you will not see any warnings. See Browse Happy for more info. I liked the old dashboard better. Everything in this new looks so… plain. The old one had more design. so fresh,. it’s simple, but cool,. I’ll write more than before with this new look,. thanks,. Looooove it. I’ve sometimes been drafting longer posts in simple text editors precisely for that distraction free approach — now I can do it right on WordPress (especially nice since one of my computers is a CR-48 Chromebook). Great work! It looks very nice and useful. Very, very nicely done! Kudos to the UI/UX team(s). I’m excited to try it out right away. But even before I do, I can already tell you that before the redesign there were two points where one could collapse the menus to icons. Now only one. On my netbook using Chrome (more real estate above the fold to begin with), this now involves a lot of scrolling to the very bottom of the menu list. That second collapse point would make a great redesign perfect. Folks, maybe you will create `return to old one design` button? The actual navigation has not changed. It just got a little higher on the screen. Everything still opens and closes the same as it did before. There will not be an option to revert the design. I headed over to check out the new feature after seeing this post, and I liked it so much that I finished a blog post I’ve been meaning to write for the last week or so in under an hour! I especially love the way that the options bar (that allows you to link text, italicize, etc.) slides down the post with you as you scroll, and the way that everything fades away after a few seconds. Surprisingly, it really DID help me focus. Thank you all for constantly improving the functionality of this site! I seriously miss the New Post link on the header area. This helped me hit “New Post” on a hurry (specially when inspiration strikes you know, just like now 😉 ). Please consider putting it back. Putting it back will not make the new design look ugly at all. I am so excited about the new additions. I just last night updated the app for my blackberry 1.5, and I just love the new finessed look. It’s smooth. Not only what I am writing looks amazing, but the menus are fantastic. WordPress really went in on their upgrade. I am quite happy to see beauty when I blog on the go. I have no complaints. Overall I love the upgrade. And I understand removing the New Post button from the top, but that button also had easy access to the drafts section. I really miss that as our site tends to have lots of drafts that are worked on over a couple of weeks. Loved the idea of making us free to write! That’s the way! This will help everybody that loves to write and are not a geek! Indeed, liked the fact of know that the wordpress company cares about the improving of writing! Well, all compliments aside, I can say this much: Jane is going to have to read through SO many blogs in the next 48 hours celebrating this new look. Well, all the best! Luckily I read with both eyes, so it goes super fast! Thanks for all the help with just write, every bit helps. I just took a quick peek and I can’t wait to write my blog post tonight. Awesome changes. I like the new look. It is an improvement over the old setup, without being so drastically different that it is hard to figure out. Facebook should take lessons from WordPress. I will never understand why WordPress does not care about Opera users. Something is wrong with this upgrade with the Opera browser. I am not very happy! One of our commit-level core developers uses Opera exclusively, and we did test with it. Which version are you using? Can you send a screenshot to support so we can see what you are seeing (first make sure you’ve tried clearing your cache). Thanks! I know I’m an arse for pointing it out, but “submit” was misspelt as “subwit” in the Approve and Reply section. Because my hands don’t work very well, I recently switched to the Dvorak keyboard layout. I am getting used to it, but M and W are still a struggle (that finger doesn’t really work anymore). Sorry for the typo, though I had already corrected it by the time I saw your comment. I like the distraction free writing. In the beginning, the formatting header was appearing and disappearing while I didn’t touch my pc. Luckily, it stopped while I was writing. I also like the new ‘Add New’ button on the admin bar. The new design is a little bit… colourless. I like the simplified menu on the left, but I miss some colour in the new design. I love the new layout and design! I liked the old full screen enough, but this I like even better. People still use IE6? That’s insane. I’m using IE9 right now. Geez. I love how much faster the dashboard is now. Thanks. I love love the new layout! so much better!! I really think that the site stats should have its own section in the top header! its really important to me and i would love fast access! I agree with you! I was just talking about this with Matt the other day. I would be very surprised if this doesn’t happen in the nearish future. This is how to do a redesign properly. I don’t like it. I write a post, then save it in draft to revisit later on. The old style had a button at the top of the tool bar to quickly access drafts. Now I have several more steps in the new advanced tool bar to reach the drafts. But I guess it’s progress. Not to be a party pooper since I do like the changes in general, but some of the advanced offerings, like underline or text color and media postings, aren’t available in fullscreen and I use the advanced controls a lot, especially spellcheck and the picture and video features. I do like that I can go into HTML mode in fullscreen and how well it cuts the distractions. I don’t like it. It looks like an older version rather than a newer one! Everything’s block-like instead of smooth. Doesn’t anyone else feel this way? Or are they just hiding? And I agree with Laura(lea) H.
So far I don’t like it as it appears to have interfered with my ability to upload photos from my desktop!!!! Not a happy bunny at the moment. What browser are you using? Have you tried clearing your cache? We didn’t make any changes to the media uploader, so if clearing your cache doesn’t help please try contacting support. Maybe instead of the new design being that bad, it’s just that I have an old browser. When I logged in, there was a little box that said: It appears you have an old, unsupported version of Firefox browser. I don’t have Firefox, I have Flock. Is this why the upgrade doesn’t look so good? Flock is built on top of Firefox, that’s why you’re seeing that notice. You should probably think about picking a new browser, as Flock ceased development a while back. Flock recommends Firefox or Chrome as replacements. I just tried the “just write” option and loved it! It felt much more creative and I didn’t realize how cluttered the other page felt until I tried this one. Even so, I am glad you kept it easy to add images as I like to do that while I am writing. Thanks Word Press! Suave! I dig the new look! Keep up the good work! Awesome! Google Chrome or Safari all the way!!!!! Very bad news. I can not manage a blog. And where there are statistics? I will have to delete the blog with this service. None of the screens — or their menu items — have moved, and stats are right where they’ve always been, so I’m not sure why you say you can’t manage a blog anymore. You might want to contact support for assistance. New dashboard looks great! It’s a good change without being a complete overhaul. Thanks! But Everything Else Is Cool! Image editing is the same as it was before. You can resize an image when you upload it by clicking the “Edit Image” button. I noticed something was different and I was thinking this is so odd (cause I just hooked up a new monitor)… then I realized WordPress much have had an update. Ohh! So this was the update, and here I was freaking out, how come the page is not loading completely, my internet connection is awesome! WordPress FTW! you guys rock, my dashboard now looks better then before. Nice update, but it’s going to take some time getting used to it. I’m already raising my eyebrow left and right. For now, I like the old dashboard better, but as time ensues I’ll probably be used to the new ‘faster’ dash very quickly. Thanks! We appreciate your keeping an open mind. Hopefully within a few days you will get used to the new look. Nice, I already used some of the features, I especially love this thing where you use previous posts as a sample for the new one. I tried to make a new category for my new post and it didn’t appear in the right sidebar. But when I clicked on Categories in the left dashboard-sidebar, it was there. So I copied the entry, refreshed the “new article”-page, the category appeared and I just pasted my text, but it would be nice if that would be fixed, of course. That doesn’t sound like an issue that is related to this new update. Can you report the problem in the support forums? Thank you! I absolutely love it. Like somoene said it, it’s like an empty canvas, and all you have to worry about is filling it. Thank you, before I did get distracted with all the buttons and I never liked going to the full screen mode till now. 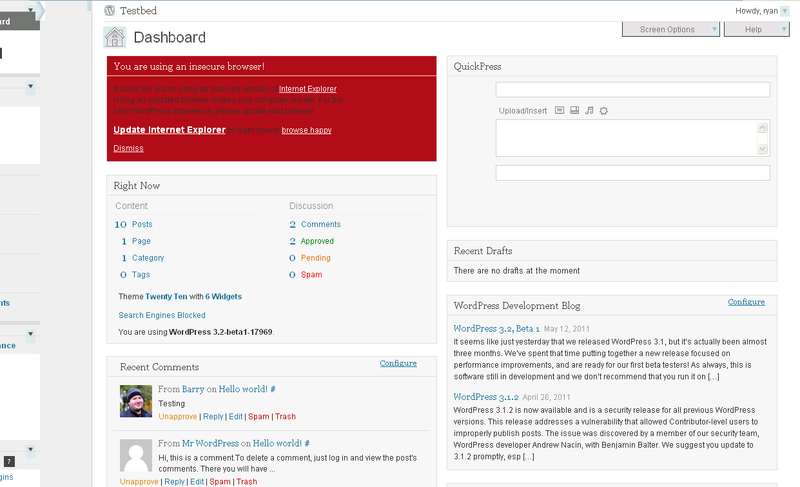 I’m happy that this update is not a drastic change and I don’t have to go relearn WordPress. I like it the changes, so far. Love the new dashboard layout. It feels more professional and does take up less space. You know what would save even more space? If “WordPress.com tip: Want to stand out from the crowd? Buy a premium theme →” didn’t appear at the top of my dashboard at all times. That little yellow box used to be a great way to see new features or news. Now it’s a pesky banner ad. I completely agree with you. The tips and blog post announcements that appear in those alert boxes should not be persistent. The logic on how those are displayed needs to be improved, and I would like to add the ability to dismiss notices without having to follow the link. One step at a time! I made your link clickable so more people can check it out. Glad you like the update! I noticed over usage of Arial in the WP 3.2 beta. I hope that would not be the case in the stable build! Can you try clearing your browser cache? That seems to solve the problem in Firefox. If that doesn’t help, please contact support. Thanks! I like it, it’s very slick and tres cool… but the Dashboard is still missing the Random Blog arrow, which was one of the coolest features on WordPress, as well as the ‘Add To Blogroll’ button, which was extremely handy to have. Other than that, great job. Amazing update, kudos to the developers! The older dashboard looks better. But its ok, I love the new one too. A question. Are you offering Chrome Frame support for users who are stuck on Internet Explorer 6? I could not locate it in the source code. Google has made it to work without requiring the administrative powers… So this is something that can still be offered? We’re working on it. Hopefully it will be implemented in the next update within the week. Well, I must say the new style is VERY eye-friendly, especially with bloggers such as myself, who have poor eyesight to begin with. It also looks very nice with Firefox Mozilla, which I very recently switched over too. Bravo and props to all involved!